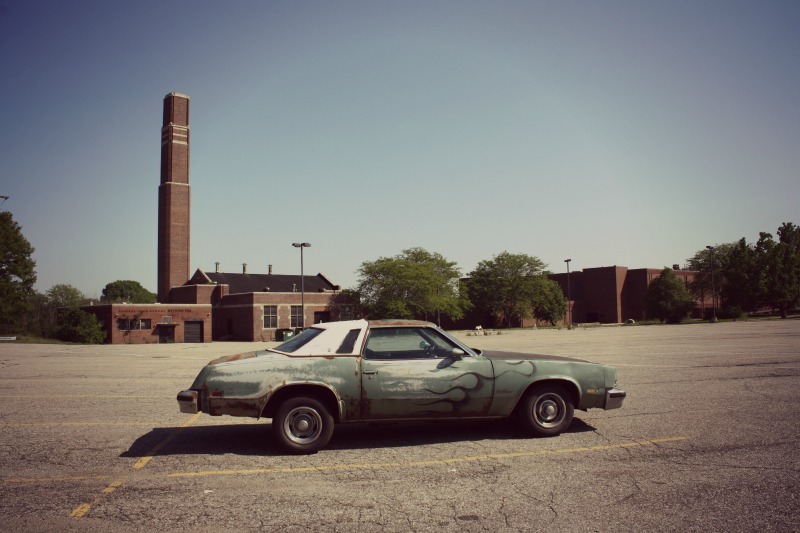 This ’77 Cutlass Supreme, photographed in the parking lot of Flint Central High School, is almost like one of my Cars Of A Lifetime in that many cars just like it were once a part of my everyday scenery as a teenager. While I never owned a Cutlass of this vintage, I did own its Chevy cousin. Twenty-three years ago around this time of year, I was a senior at Flint Central awaiting a graduation commencement ceremony at Whiting Auditorium, full of uncertainty about the future and having given up my childhood dream of becoming a car designer. There was no good reason for abandoning my dream outside of a lack of self-confidence in my math and science abilities, but that’s a topic for another day. 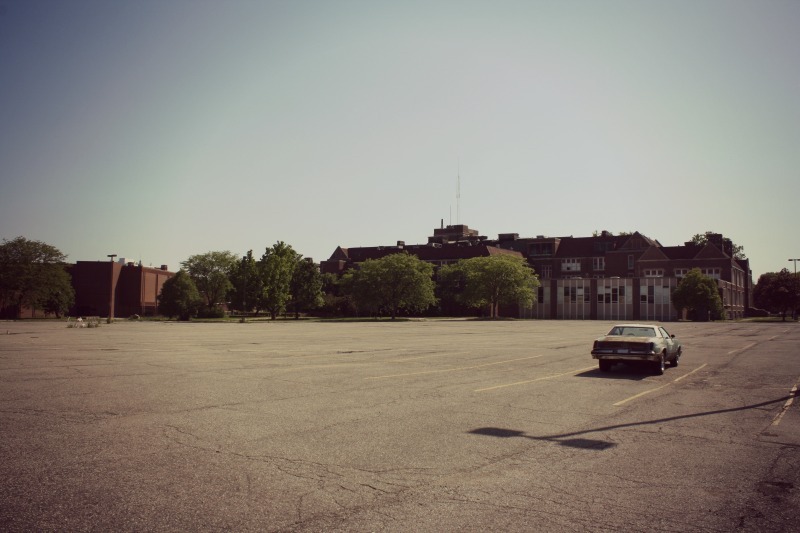 Many GM “Colonnade” mid-sizers once populated this very parking lot. My first car purchase in the fall of 1991 was a ’76 Chevy Malibu Classic coupe in “Buckskin Tan” with a matching interior, for the princely sum of $1,500 cash (roughly $2,600 in 2015 money). It had bench seats front and rear, and the de rigeur powertrain combo of the SBC 2-bbl. 350 V8 and three-speed Turbo Hydramatic. The ‘Bu was thirsty, but it always started in the Michigan winter, ran smoothly and effortlessly, had reasonable pickup, and was nicely appointed and comfortable. I loved activating the high-beam switch on the floor with my left foot. I also liked how the nubby seat upholstery smelled a little like inside a thrift store, at many of which I used to buy clothes in my quest for individuality, and well, out of being broke. Gassing up that car wasn’t cheap. My family moved to southwest Florida in 1992, and I sold the Malibu in Flint to a friend’s brother with the hope of finding a straight-bodied Southern car with a little less Bondo. I plan on writing a COAL about my Malibu at some point, and I want it to be clear that I loved that car. I had always presumed these Colonnades were fairly easy to work on, given their presence on the streets of Flint even as late as the early ’90s. GM factory jobs were still fairly plentiful here at that time, even if there weren’t quite as many as there had been several decades prior. Even if you weren’t mechanically inclined like some of the guys in shop class, chances are you had a mechanic in the family or knew someone who could keep your uncomplicated, mid-70’s GM machine running fairly easily and inexpensively. In fact, my Malibu was the only car I looked at to purchase (out of four or five) that our family mechanic, Ted at Autotech, approved of. Most any Colonnade was a simple, substantial, generally reliable car, not unlike a big, lovable, affectionate Mastiff – and every bit as thirsty, and about as graceful. Pulling my Malibu coupe’s big doors shut would require a combination of muscle, grip, and momentum, and would be followed by a loud creak, a “chunk” sound and a few seconds of rattling door glass. Its sheer mass just gave you the impression that it was a safe place to be. Of the four lower-tier GM makes, loyalty and presence was fairly evenly represented in Flint Central’s parking lot. There were a few Malibus and Monte Carlos, Cutlasses, Regals, and a Grand Prix or two, among the Ford Escorts, Chevy Cavaliers and Chevettes, and Chrysler K-Cars and Omnirizons which dominated our parking lots. There were S-10 pickups, a few mid-70’s F-bodies, and the usual assortment of imports – some hand-me-down Hondas, Toyotas, a few Datsuns / Nissans, and at least a couple of Mazdas. This is a big parking lot, and it was mostly full in the early 90’s. The most exotic car in our parking lot was an upper classman’s mint-condition, triple-white ’72 Grand Prix hardtop. My freshman year English teacher, Ms. Fisher, drove a silver, mid-70’s Lincoln Continental Town Car that looked as large and imposing as did some of her homework assignments. Many of the Colonnades in our parking lot were accessorized like the subject car: jacked up in the rear, non-standard wheels (these Chevy Rally Wheels are among my favorite designs, ever), and usually a body panel or two in a non-matching color from a donor car. The subject car appears to have sported custom flames at some point. I photographed the subject car in May of 2012 during the week of the final, official FCHS Alumni Dinner to be held, which was also the year of my 20-year high school reunion – both of which I attended. (I even got to visit with Ms. Fisher, who now takes amazing photographs in her retirement.) This Cutlass seemed almost like an old, school buddy – a little worse for wear, and sporting a lot of unfamiliar ink, and seeing it here was like a chance meeting with someone I always thought was cool and used to see between classes on a semi-regular basis. 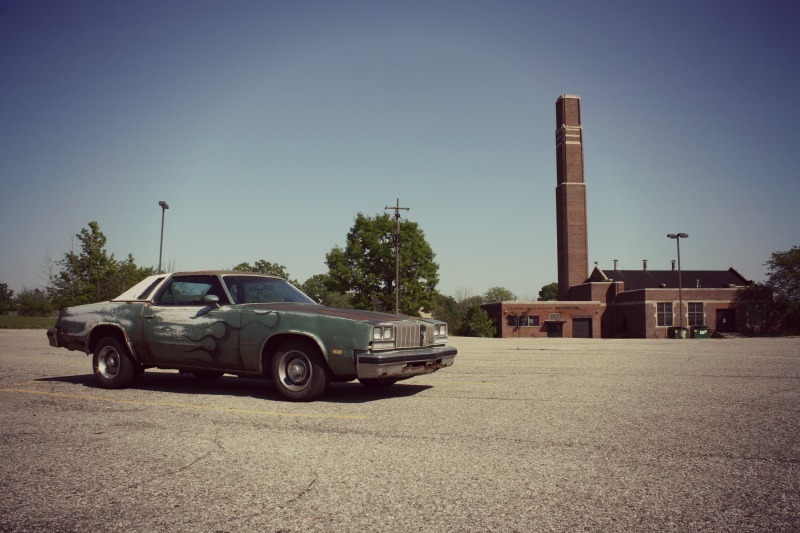 Curbside Classic: 1973 Buick Century Regal – The Confident Colonnade? Deuce-and-a-Quarter! Love it! You were rolling in style. Totally agree with your idea that the Colonnades were like the Tri-Fives of their generation – brilliant. The only collinade I can remember anyone in my family owning was one of these. My aunt bought it in the mid 80’s for a grand. It was buck skin with a cream colored half vinyl top and matching interior. I remember it being a reliable car when I was a small kid and it was easy to get in and out of the back seat. It gave her a lot of crap. She kept a screwdriver in the glove box for when the automatic shifter and the turn signal shifters fell off. She spent a lot of time with her arm out the window using hand signals. It never failed to get us to the elementary school everyday. She drove it another year before giving it away and buying an S-10 blazer, a little less easy to get out of due to getting older. But all of us remember that olds fondly. Thanks for the memories. I miss that boring large barge brougham coupe. Just keep rolling and afloat in some other areas to make it up ( similar to manipulating CAFE numbers by making Cavalier and Corsica ) and it will be fine. When necessary, getting an A in literature course to keep the overall grades good and stay afloat in engineering lessons. Wow…..And I ACTUALLY survived the ’70s! Likely the reason the high beam control moved to the stalk for the ’76 models. I believe that was a fed mandate. I remember when Halogens first came out. Very bright wide beam and the glass never went cloudy. IMHO far superior to the overpriced projection systems popular now. My driver’s ed car was a ’78 Volare and it had the high-beam switch on the floor. You’re probably very right about what it takes to be an engineer. With me, it was more of a self-confidence issue than anything. I was always pretty good at math and science, and I got an exceptional education through the Flint Public School System’s Magnet Program (a busing program for schools throughout the city which specialized in subjects). I lost my nerve after I went to a two-week summer program at GMI (now Kettering) for wannabe engineers to get a taste of what college classes would look like. I believe everything happens for a reason, though, and I was glad I wasn’t working for GM when the 2009 US Auto Industry crisis happened. I wish you all the best with both your studies and with your Volaré, and look forward to your next post! I remember these colonnade Cutlass Supremes being everywhere in the mid to late ’70s – Olds was happily selling hundreds of thousands each year. No other GM intermediate approached these numbers in terms of production volume. I knew people who were severely disappointed when the car was downsized for 1978. A friend in high school had a Monte Carlo of similar vintage, burgundy with white vinyl hafl-top. A tank of a car, could easily jump a curb and run over a stop sign (As the driver did once, struggling to find a lighter). Agree with the author, thinking of these cars in terms of modern virtues is a bit beside the point – they were big, plentiful and cheap to keep running, which was enough for the people who bought them (especially used in the 80s). Also agree that the floor-mounted high beam switch was cool (so long as the floorpan didn’t rust around its mounting due to the galvanic corrosion, which many did). Left-floor high-beam switches were standard Detroit practice back then, I had completely forgotten about them until now. They had a satisfying, positive click action. Supremes were about as popular as SUVs today. I recall my mother liking the Cutlass, but she never got one. I miss that solid click, like dialing a rotary phone, the floor mounted switch still feels natural, but at the same time 30 years from now, almost nobody will “get it”! Kinda sad. The Salon models (the ones with the flags) had a column dimmer, to reinforce it’s “European-ness” Also shared with early Grand Ams. I’m pretty sure that’s a 5-speed. I’d know that shifter & boot anywhere. I had one in my ’76 Omega. B&W T-50, weak-assed gearbox. It’s a shame about that rust! And also about that 260 – I’ll bet this car was kinda slow. I did like the standard “S” rear quarter windows and roofline, but I preferred the ’76 models’ slanted header-panel over the upright style of the ’77s. These cars are a great example of what GM did, and still does, best. A big, front-engined, rear-drive vehicle using a small block V-8, and an indestructible automatic transmission – oh, and the greatest air conditioning on the planet. Its core elements are basically immortal and easily repaired. Lots of room inside for the driver to stretch out comfortably. An hour or two spent flying across midwestern highways is effortless to the point of actually being refreshing- seriously two hours on the interstate in the prototypical GM vehicle is quieter and more relaxing than most hotel rooms, and the sound system is way better. Nowadays these vehicles are disguised as SUV’s to get them past the “cars-will-destroy-our-planet©” busybodies but they still rule the highways of middle-America and I hope that someday they can return to the elegant beauty of those A-bodies and their 60’s predecessors. That line got me. When I got my 73 Chevelle in my senior year (90-91) it had a little rust and a Flat Black passenger fender. Colonades were still relatively popular in the late 80s and early 90s around the Chicago Burbs. “Grandma” cars were still plentiful at the time for cheap. Sadly either out of benign neglect, “hot rodding” or in two special cases a full restoration to show status and being indefinitely mothballed they all disappeared. Your round-taillight ’73 Chevelle was the model year I wanted! 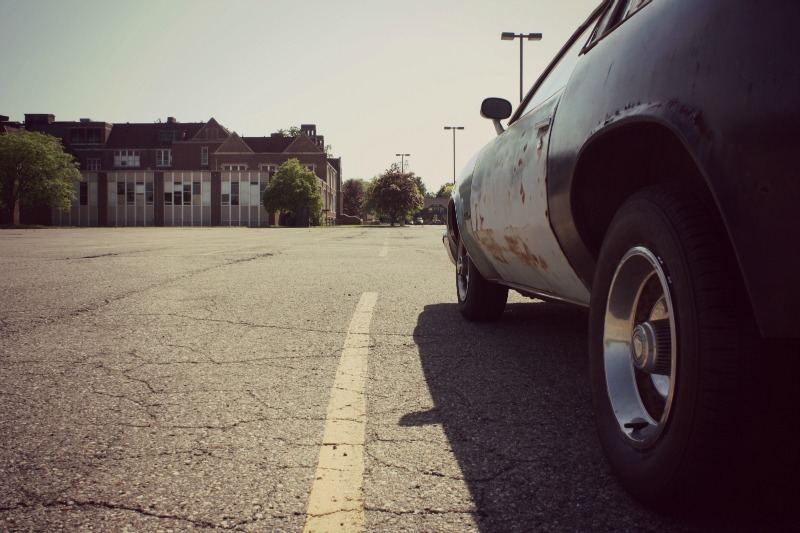 I had a classmate with a faded bronze ’73 Laguna that I really liked and secretly coveted. There was something about the round lights. The Laguna was really the best of them all. 74s oval lights weren’t bad either, 75-77 were just a bit too bland. I was already well out of high school when these were brand new. The only member of my family who would ever own of these was my Uncle Don. Uncle Don had owned/driven nearly new, low-line, Chevy full sized wagons forever. 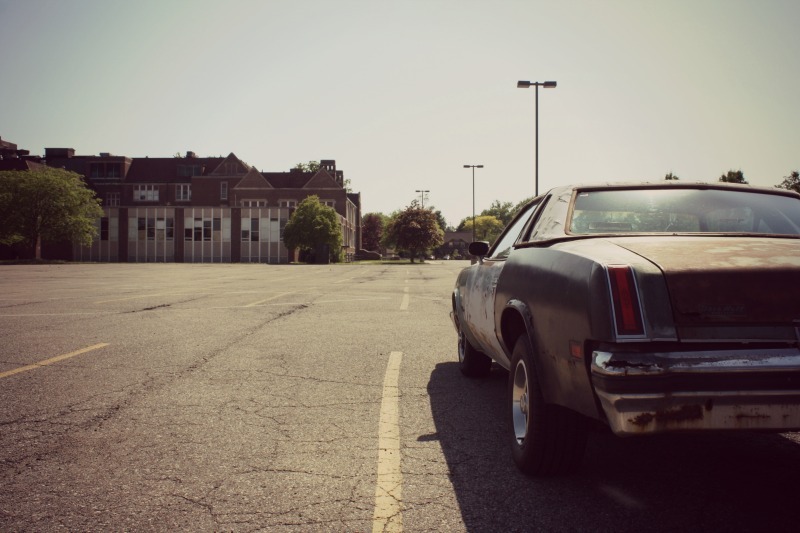 Then, 1 afternoon he and my Aunt Margaret drove over in their new car….a mid 70s Buick Regal coupe. NONE of my other uncles (11 in all), would EVER own as neat a car as I thought that Regal was. It would be replaced a few years later by another Regal coupe. (Cars were Uncle Don’s 2nd “indulgence” with good cigars being his 1st.) Yet I always preferred that light metallic green Colonade with a white vinyl half roof and interior to it’s later, downsized “sister”. It’s a shame 99.9% of the Colonades (no matter the body style) are now jacked up and rolling on 22-26 inch wheels with gawd-awful paint jobs. I always loved the 1973-77 Cutlass Supreme. I still do – if I could find a nice original one that isn’t in need of a ton of work I would grab it in a heartbeat! My sister’s boyfriend now husband had a 1975 Supreme Coupe that I rode in many times. It always felt like a solid, well-built car. And one can never forget the sound of the Oldsmobile Rocket 350 V-8!! One of my favorite cars ever! I was surprised to see the production numbers of the downsized ’78 Cutlasses as they sold very well too. The problem was that the 1977’s were so wildly popular – IIRC I think the entire Cutlass line sold over 600k units in 1977, so GM had a tough one on its hands to fill with the redesign. Luckily the American public took well to it. The Cutlass name was sacred at the time, so GM had to make sure it made a good-looking, reliable, well-built successor to America’s beloved Cutlass. In my eyes, I think they succeeded quite well. I did also really like the downsized ’78 Supremes, Supreme Broughams, and Calais models. That’s the last Cutlass body style I truly loved, especially when rolling on those body-colored Super Stocks. The smooth-sided ’81s, while still okay, just didn’t do it for me in the same way the ’78s – ’80 models did. The Salons were lovably hideous…the coupes were okay. I rode in many of those ’78-’80 Supremes over the years. GM made sure those cars were screwed together well, using the best materials possible. I’m convinced that they made sure the Cutlass was going to please the American public because that was the car that middle class America loved and trusted. Everyone that I know that had one loved it. 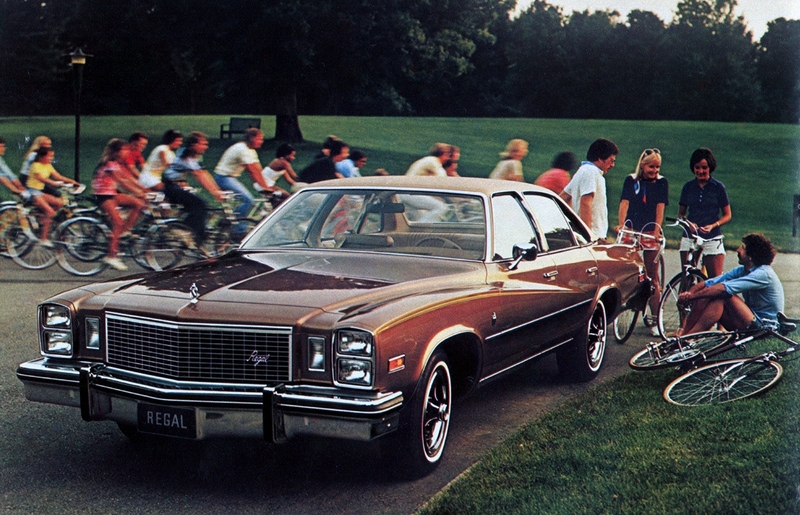 One of the most memorable was a friend of the family’s 1979 Brougham Coupe. It was black with a black landau top and tan colored leather interior, a power sunroof and the black Super Stock wheels. I remember when they first told my Dad they were special ordering it, it was right around Christmas time. It took almost 3 months to come in – I think it was April when they finally got it – and they nearly cancelled because they needed a car and didn’t want to wait for it to arrive. They were about to pull the trigger on a regular Supreme Coupe in the dealer’s stock when the dealer found out their car was being shipped. It was such a classy car – I remember the first time I saw and rode in it, I thought it was the nicest Cutlass I had ever seen! Apparently the delay was caused due to them ordering both a sunroof and the Brougham interior in leather – the manufacturer of the seats had a huge backorder issue and it made the car sit while waiting for the interior to be made! That black-on-tan ’79 CSB sounds like a dream – visually about as close to a Hurst Olds of the same year, but keeping its broughamness intact. If I could find one like that in good shape for a good price, I’d be sorely tempted. My dad had a 74 Supreme he bought new. Bucket seats with the shifter in the floor. When I was 11 he used to teach me to drive on it, I told him I wanted it when I got my license. Back then most people in the south had CBs in the cars & I would love to ride with him and watch the antenna slant to the back when he would speed. He traded it roughly a year later due to slipping transmission for a Ford Fair Fairmont Futura. He claimed he forgot I wanted the Supreme. My neighbors had a beautiful 77 Pontiac Grand Prix 2 tone silver, bucket seats with floor shifter & t-tops. They drove that car like it was the General Lee, I was in jr high & they were in high school. My mom stopped me from riding with them because she thought I’d be killed riding with them. My dad had a 76 or 77 Supreme in the 70s, in fact it was green with a white vinyl top, although I think it was more lime. Originally had the Oldsmobile rally wheels too(also green), which, as much as I agree that the Chevy rallys look good, they belong on Chevys and don’t look nearly as good as the Olds rally wheels. I think the Collonades are one of those cars where you had to be there to understand. Some cars transcend generations – prewar V8 Fords, the tri-fives, most of the Muscle cars, ect. You don’t have to be a baby boomer to love a Dodge Charger or be part of the greatest generation to understand the allure of Hot rodding, I was born in the late 80s and I love it all! But the Collonades are so deeply engrained in the 70s, with all the baggage with it, that they just seem like ugly relics to my eyes. I instantly was fascinated with Muscle cars the first time I laid my eyes on one, same with hot rods, in fact my Dad showed me pictures of most of his cars he had when I was a kid, his first was a 71 Charger, next was a Collonade 442, after that the aforementioned Supreme, the 78 Trans Am, and the downsized 78 Supreme he and my Mom got married in. Two cars in that scrap book I desired, shouldn’t be hard to guess which ones they were. I’ve learned to appreciate the Collonades, but I really had to dig deep to find something endearing to them, even though in many ways they were superior to the legendary 68-72 A-bodies. The 73 styling never looked very good to me since the neoclassic inspired round headlights used on all of them from Chevy to Buick just looked dorky and retrograde, and while the later square quads helped they ended up looking a bit mismatched with the still relatively swoopy body. The Cutlass I really do understand the appeal of, since it’s squared off flanks, formalized roofline and more upright tail all seemed more uniform than the other division’s equivalents, but alas, if you’re not a fan of earth tones and grew up in a time where 100% of the Collonades you see are even more worse for wear than the feature car, it’s very hard to fall in love with them. Some cars wear rough patina gracefully, their predecessors do(like that primer black LeMons recently featured), these do not. I never considered the GM collonades ugly. I thought they were plain but not ugly. But I did not like the cars overall because they were such dogs. Ridiculously slow and poor handling. When I was a teen, these were considered a pathetic facsimile of a muscle car. A fake. A fraud. Bought by fools who did not know any better and who thought they were getting a real Chevelle, or a real (fill in the blank). I think the middle years were ugly, the 74-75s that transitioned from 1973’s low deck “second gen F-Body on steroids” look to the taller deck/big rear bumper cars while still retaining all the wild bodylines of the originals. The squared off square headlight cars from 76-77 were the boring ones, but I’d argue the Buick was the least attractive from start to end, especially the stacked headlight sedans. Those are just horrid looking cars. I share your opinion that the Buicks were probably my least favorites, with the exceptions being the original ’73s coupes, then the ’76 & ’77 coupes – all variations. I’m not a huge fan of the fender-skirted Pontiac Luxury LeMans models, either, but as far as frontal styling goes, at least those never received the stacked quad headlamps that somehow don’t work as well on this brown Regal sedan the way they did on the Montes and Malibus. Looking at what Ford and Chrysler were doing with cars like the Torino or the Monaco, the Colonnades were not really that bad for the time era. None of these cars were aimed at the muscle car market with any seriousness. Cars like the 1973-77 Grand Am and Cutlass 442 or even the Laguna came closest and if one of the largest V8 options was ordered power was at least reasonable. What these cars all did far better than the 60’s muscle cars was stop, steer and handle far better. And so was the ride quality for the most part. Quality control and fuel mileage were hit and miss and much dependent on the engine/transmission chosen. Wow, it’s nice to hear some positive comments & fond memories of these. Those shots of the poor subject car are excellent but leave me wondering….who left it there…and why… If only that car could talk…. My father bought a rusted out Mandarin Orange ’77 Supreme at a dealer auction twenty-something years ago — it had these same rally wheels unfortunately. My father’s buddy had a white ’71 Monte Carlo with some old chrome aftermarket wheels on it — Imagine my surprise that the wheels got swapped after my suggestion — my planets were aligning. That rusty Cutlass was quite peppy & drove a lot better than it looked. The buckskin quarter top & matching vinyl interior really brought out the ugly in that mandarin (dull orange) color and its option content made for a dull vehicle: 1/4 vinyl top, full wheelcovers, A/C, AM radio & little else. In fact, its build sheet stated that it was delivered to Hertz Rent-A-Car. At least it had the 350. This is exactly how I remember these cars too. I would call it a pathetic excuse for a muscle car. “Peppy” is a relative term. Remember that cars have to be evaluated in the terms of the time,and market realities. The “time” for me was my teen years when all the guys I knew were cruising the main drag every friday and saturday night. Chevelles, Novas, Various Mopars, Mustangs, Camaros, a few Monte Carlos, a few Torinos/Galaxies, and various Pontiacs/Oldsmobiles were what was popular. Mostly of the 1965 to 1971-ish vintage but there were some exceptions. Nobody wanted a collonade of any kind. They were a joke. I never did get it dynoed but I estimate I had about 425 horsepower. The size of the car looked like it should’ve weighed about 5500-6500lbs. It was a unibody though, so it weighed much less than it appeared. I guess since my memory of these collonade cars was mostly of dumb guys thinking their 1974 chevelle was like a 1970 chevelle because it had the same name, I have a mostly negative image of the car. K, True enough, But comparing a ’69 anything vs a post ’72 anything is almost moot. Not just in the performance car realm. My 1970 Cadillac Fleetwood would have absolutely smoked my 1989 Cadillac Brougham, despite the ’89 being shorter and hundreds of pounds lighter.Two gas “shortages”,government edicts; rising insurance rates and “primitive” technology to deal with it all in a rather short period had it’s toll. I’ll give you that Colonnades were generally not very fast cars, but your sources for performance data is not good. Auto Catalog is just estimations. The 1973 350-2bbl was the base V8. A 1970 Chevelle its base 307-2bbl wasn’t fast either. 1/4 mile: 15.7 sec at 88.4 mph. Sure not super fast, but that was with 2.73 gears. That’s in the same ball park as a 325 hp 396 Chevelle. As far as handling goes, the Colonnade Chevelles had greatly improved suspension geometry and were in fact better handling car than their predecessors. This was with 3.23 gears. Those numbers aren’ t too far off the “slow” 1973 Chevelle with it’s weak “245 hp” 454 smogger engine. Anyone can cherry pic numbers. I’m not into that game. I never saw a collonade that did not have either a 350 or the smaller V8. John you started that game by quoted the inaccurate Auto-Catalog numbers. I was just posting some remotely accurate numbers from a actual road tests of these vehicles. That said, even in the earlier golden years of performance, by far the most common engines in most cars were low performance options. For example in 1969, the most common engine sold in the Chevelle was the 307-2bbl. The performance of this car was nothing to write home about, in fact it was probably pretty on par with a Colonnade Chevelle with a 350-2bbl. I started no such game. I used the same source to compare vehicles. You, however, chose to cherry pick. My dad bought a 1974 Malibu sedan with this same engine combo and never once complained about it being slow. Many of these posted numbers online should be taken with a grain of salt as quality control varied from one car to the next, fuel quality sucked and most of these tests were with green un-broken in engines. His was a lower mileage 62K elderly one owner car so it was in need of a tune up and carb rebuild due to sitting around for a year until the estate could be settled. After my uncle, who was a mechanic that owned his own garage, rebuilt the carburetor, tuned up the engine and ran a little more timing got done that Malibu ran very well and felt much more brisk than 11.7 seconds 0-60 and got better than 17-18 MPG with more highway trips. Being realistic about the time era involved brought things more into perspective. With the oil embargo, tightening emissions standards and insurance companies getting on the bandwagon raw power was out and peppy was a better term to describe the V8 powered 70’s cars. If anything the worse was yet to come. 1980-1982 were the absolute pits for performance with 85 HP Slant sixes, 105 HP Olds 260 V8’s, 112-115 HP Ford 255, 115-120 HP 267 Chevy’s and 125 HP HT 4100 full size Cadillacs. That was a true malaise era! Joe, I agree with you. My dad to owned a 1976 Malibu 2-door with a 350-2-bbl engine. While it was never a powerhouse, it had more than enough power to get the job done. I can remember having six people in that car a full load or cargo and towing a loaded boat to summer cottage vacations without issue. The thing about these old low powered V8’s is that they may not have had high peak power, but they still had strong horsepower and torque in the low RPM range. This made them “feel” faster and more powerful than some modern small displacement engines with similar power outputs. Dad’s old Malibu was fast enough for that time and certainly outperformed the smaller displacement V8’s that followed. That said, I drove that same car last week when my brother brought it by for a tune-up. While that old 350 is reliable as ever, and runs just as well as ever, it sure doesn’t feel as powerful as it used to. Sure you may say some of it is engine wear, but this was just after a fresh tune up, and the car does run a hotter ignition curve as well as true dual exhaust now. I think it’s just the fact that I am used to modern cars, that have far better performance than any cars have through history that the old Malibu feels more sluggish than it used to. As far the road tests goes, I have quite the extensive library of old tests. Sometimes there is a wonky test but they are usually easy to spot. Some magazines also tended to get better numbers, like Hot Rod, while others were generally slower, like Popular Science. In the end, the ones in the middle do seem to be relatively accurate. In fact many of the muscle cars that are raced today in stock form, turn out pretty close numbers to the original magazine tests. It’s just that there aren’t too many in truly stock form anymore. My buddy Geoff’s dad had a (I think) ’77 Supreme in that same Mandarin color with matching Super Stocks and the Buckskin roof. I actually quite like that color combo. Before you mentioned the wheel covers, it had me wondering if yours might have been Geoff’s dad’s car. Small world – you never know! Loved these when I was a little kid and they first came out. Tried to get my dad to buy one and even rode my bike down to the local Chevrolet dealer to get him a Monte Carlo brochure but he was busy trying to save the American Motors Corporation. Finally got my chance to buy a nice original bucket seat 64K ’75 Buick Century Custom in 1993. It’s still rolling just as pretty as back then on its chrome Buick rallies having just flipped the odometer this year. As you can imagine, in the Lansing area these were everywhere. However, I’m about 5 years older and the colonnades were still pretty decent looking when I was in High School. Specifically I recall brothers who had ’75 & ’77 coupes. The real range of nice to beater was the previous generation. Off the top of my head I had classmates with a ’69 coupe, ’71 wagon, and 68, 69, & 71 covertibles. This is the car that high-school mullet-heads usually aspired to after they’d mangled up their mid-seventies Camaro to the point where it was completely undrivable (which, in and of itself, was quite a feat). 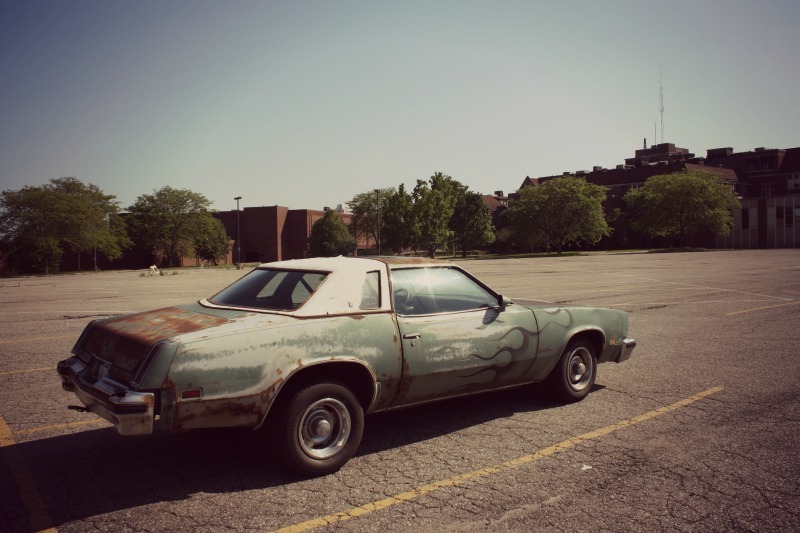 It also likely explains why there are so few mid-seventies Camaros and Cutlasses left; they’re not really worth restoring in the same way as first-generation Camaros. Great article. My dad bought his 1976 Malibu when I was in high school. I have a lot of fond memories from that car and it was way cooler than mom’s wagon. It certainly worked and drove better than my rusted out 1972 Chevelle with a 250 and PG. I look forward to reading about your 1976 Malibu. I’m lucky my brother now owns my dad’s old car so I still get to drive it fairly often (I am also that cars mechanic and still enjoy working on it). Good article and one I can relate to. It’s always sad to see your once proud high school abandoned or worse let deteriorate to the point where it has to be bull dozed down. Many of your childhood memories gone in an instant. Same for the neat old Cutlass Supremes that roamed the streets in great abundance which even back in the 90’s had many admiring glances and comments. Now the new replacement high school looks like any other building with little to no character and after only 10 years is already starting to fall apart and the roads are loaded with cookie cutter silver tan and grey Camry’s, Impala’s, Accords, Civics and Corollas that nobody even notices. Time can be so cruel. It’s now quite a shock to see a 70’s or 80’s Cutlass or similar era car driving around or a high school that is still original and well kept from history and it is mind boggling to see how much has changed from as little time ago as the 90’s to present. I always enjoy posts about Colonnades. For better or worse, they are such interesting cars, with such a wide range of models, and they really were a big part of the ’70s in the automotive world (well, the U.S./Canada “world”, anyway). As a longtime owner of a 1976 Monte Carlo, I’m looking forward to reading about your Malibu, too. I’m a few years older but also grew up around a lot of these from childhood up until high school, where quite a few used and hand-me-down examples were in the parking lot.